I can’t put down my new iPhone. I picked up my 3GS last Thursday and have connected all 8 of my email accounts, downloaded 34 apps and did an untold amount of set up on it. One app provides a list of discounted apps. What the hell am I thinking? I never saw myself as an obsessive person. I guess we all are to some degree whether we admit it or not. Some obsess about cleaning, people or image. In 2004, I obsessed about politics – to the point of illness. I listened to radio programs and watched shows from the perspective of both the right and the left. Keith Olbermann and The O’Reilly Factor. Mike Savage and Randi Rhodes. Buzz Flash and The Drudge Report. And when Bush was reelected in November, I went into a funk for about 2 weeks. In 2007, I obsessed about Chinese imports. I posted links on my old website and read countless articles on the subject. A year later, I discovered WordPress. I set up my blog and went nuts as my blog obsession merged with my political obsession. I was up all night reading and writing posts. I worked at my job during the day and hung with my family for dinner all the time thinking about what my next post would deal with. When Sarah Palin was announced as the Vice Presidential running mate, I literally went insane researching. A few posts hit the thousands on the hit count with one getting 75,000 in one day. Turns out others were just as obsessed as I was. In 2009, I found Facebook. I went in hesitantly as I was afraid of 2 things. Obsessing about it AND having worlds collide. Family – today’s friends – co-workers – friends of the past – and so many more. My college age daughter friended me and as a result my sister found me. My wife was already there. I then was discovered (you can tell I’m not one for the socialization thing) by former classmates from high school – nearly 30 years ago. Fact: If I wanted to be connected with you, I wouldn’t have lost contact with you years ago. Many of my friends today are from high school and college. Now my 30 year reunion is approaching and I’m getting friend requests from people I know I wasn’t friends with in high school. Some I have never heard of. Now that can’t be a good sign. My step-son’s new step-mother sent me a friend request. My step-son’s father remarried late last year. Now does anyone think that her friend requesting me is a little bizarre? And how many hot girls born when I graduated high school are going to friend me? Really? And my profile picture is a picture of me and my wife. Do you really think I am that stupid? Then in July, I discovered Twitter. Now that is fun – sharing what I am doing at the moment. I just sneezed. Why isn’t there a tissue around when you need one? Nothing is cooler than when a famous person starts following you. And nothing is more demoralizing than when someone you are following stops following you, especially when they followed you first. It’s like getting dumped. 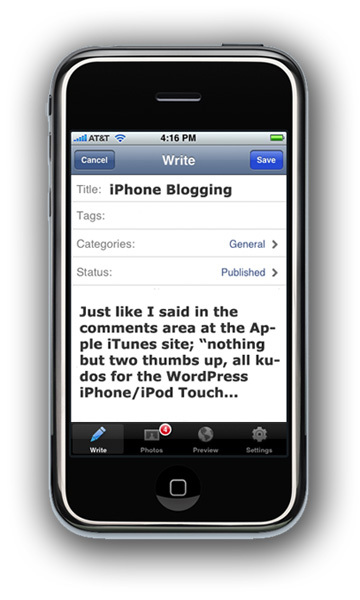 Now I have an iPhone and I have connected all my obsessions to it: WordPress, Facebook and Twitter. I’ve ordered a pizza from the iPhone. Why didn’t I just call? It has to be faster to call. What should I have for dinner tonight? Maybe Urbanspoon can help. I’ll get that new book on Kindle without buying a Kindle since I’ve downloaded the free app. Did you know you can start your car from your iPhone? And report a breakdown to AAA. There really is an app for everything. I wrote this post with the help of my iPhone – though I admit I did edit it from my computer. And I can’t stop listening to Pandora – which play list will it be today? How about 80’s Indie? This entry was posted in My 2 Buck$ of the Day and tagged iPhone, New Year' Resolutions. Bookmark the permalink.